This weeks photo is of one of the most iconic statues in Bratislava. Cumil the watcher peers at the world from a manhole. It is a popular photo opportunity for the visitor. 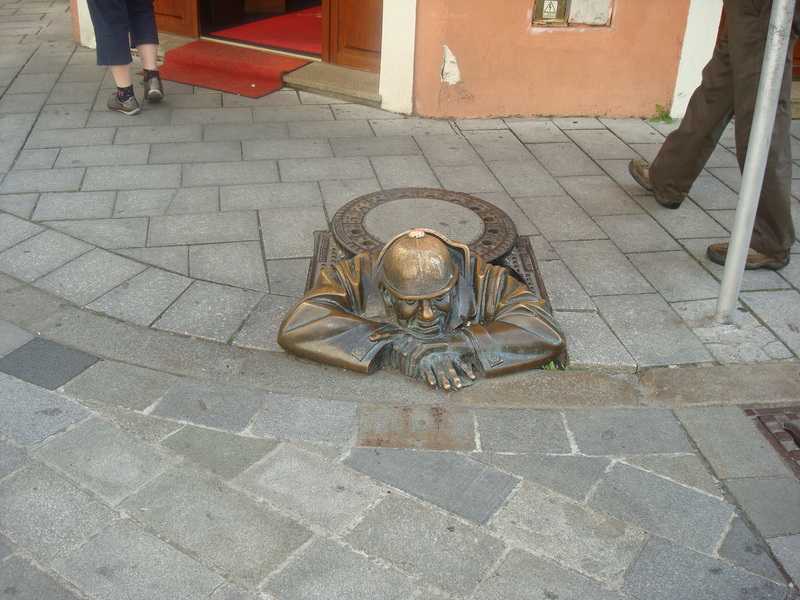 It is one of the many quirky statues that can be found in Bratislava. 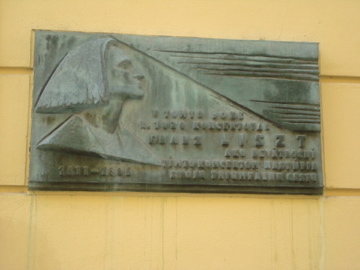 This week’s photo is of the Liszt Memorial Tablet in Bratislava. This tablet celebrates the concert that took place at the Leopold de Pauli Palace in 1820 when Liszt was just 9 years old. 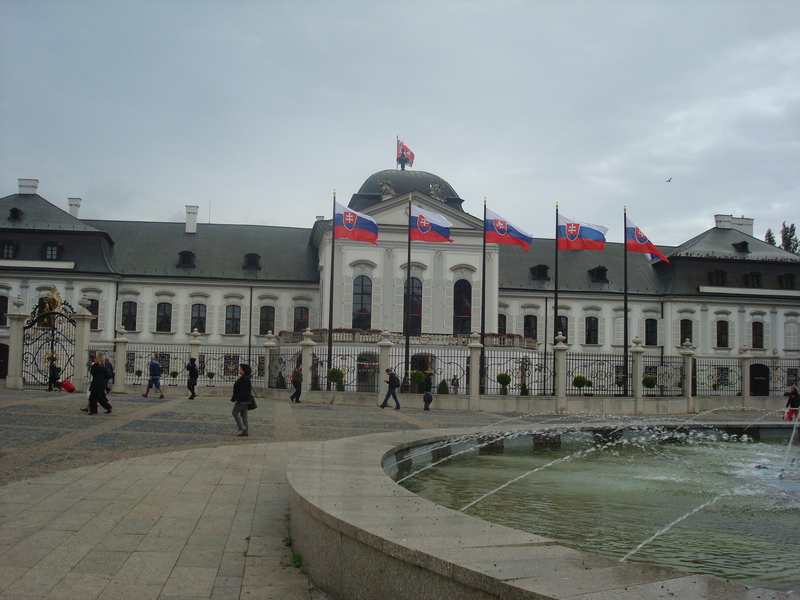 At that time Bratislava was known as Pressburg. This concert led to offers of sponsorship to help finance Liszt’s education. This week’s photo is of the Church of St. Elisabeth in Bratislava. It is also known as ‘The Blue Church.’ Built in 1907 it is probably my favourite image of my travels in 2012. This photo represents the beauty of travel. Something that you will not see if you stayed at home all the time. You can only compare with the image of the closed hospital that is opposite the church. 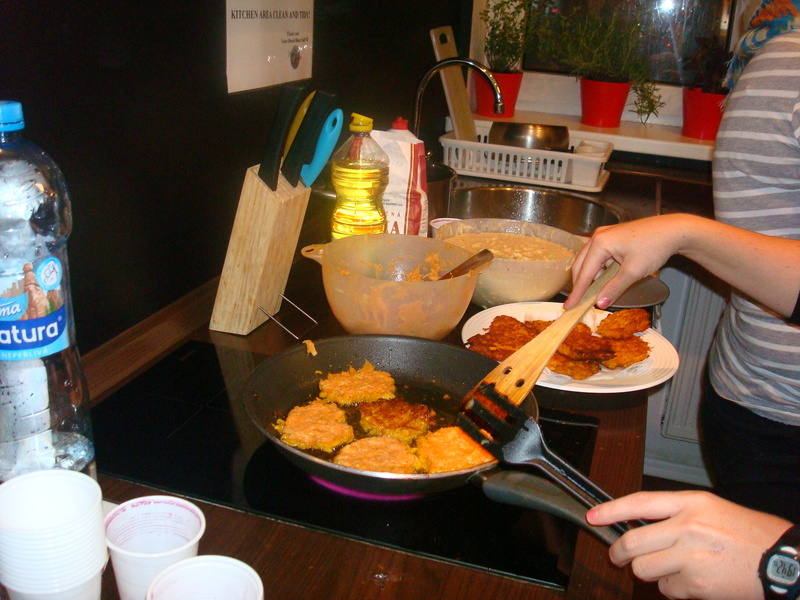 This week’s photo of a meal that took place in Hostel Blues in Bratislava. Christmas is a time where we celebrate with family and friends. It is also a time where we should be counting our blessings too. I have been fortunate that I met so many people on my travels in 2012. Wherever you may be I hope you enjoy your day. This week’s photo is of Napoleon Bonaparte in Hlavne Namestie in Bratislava. The statue created by Juraj Melis was to commemorate ‘The Piece of Bratislava’ which was signed in 1805. I see this as a reminder to the people of Bratislava that Napoleon is always watching them. More importantly it is a reminder that Bratislava is a city that does not take itself too seriously. I am sorry there was no photo last week. I am in the middle of changing computers. The photo is of a view from Devin Castle of the River Danube. The River Danube is the second longest river in Europe. It runs from Germany to Ukraine. This photo was taken from Devin Castle near Bratislava. What this photo cannot show is the speed of the river flowing. Indeed it is a mighty river. 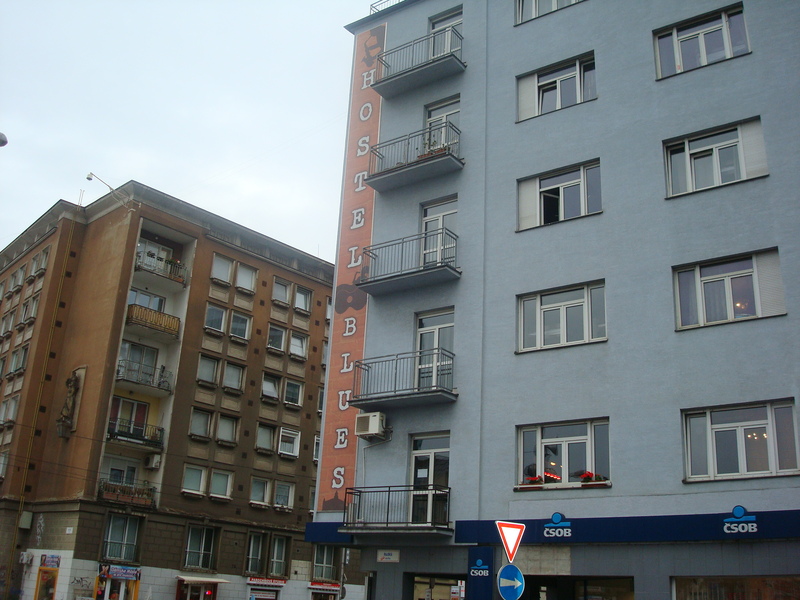 During my recent trip to Bratislava I stayed at Hostel Blues. The hostel is located in the centre of city is a traditional hostel which is famous for the double bunk beds. Entrance takes you to the first floor reception. Checking in takes a little time but you can take time to relax with a beer in the bar which is also located in the reception area. There are five floors in the hostel. Each floor is split into two blocks. Each block has two dorms, a bathroom with toilet and a separate toilet. An nice touch is that each block is named after a captial city. I stayed in the Berlin block on the 4th floor. Entrance to each block is by keycard. You use the same keycard to enter the dorm. The dorms themselves are clean and spaceous with bunk beds and lockers. There is plenty of room to move around. There is a kitchen area where you can cook your own food with a dining area away from the kitchen. Baguettes and snacks are also available in reception with soft drinks and beer. Once a week there is a communal cook where everybody helps out in cooking local Slovakian dishes. It was a great way of getting to know people and it was a very good night. The staff at the hostel were very friendly and helpful. You are given a free map upon check-in and you are given recommendations on where to go and visit. There is also a board which lists night spots which are recommended. Reception is operated 24 hours. The hostel advertises the walking tour and pub crawl. I can recommend the walking tour. This was the best hostel I have stayed in. It has a friendly atmosphere where everybody is made t o feel welcome. There is also a sense of community with everybody who stayed there. 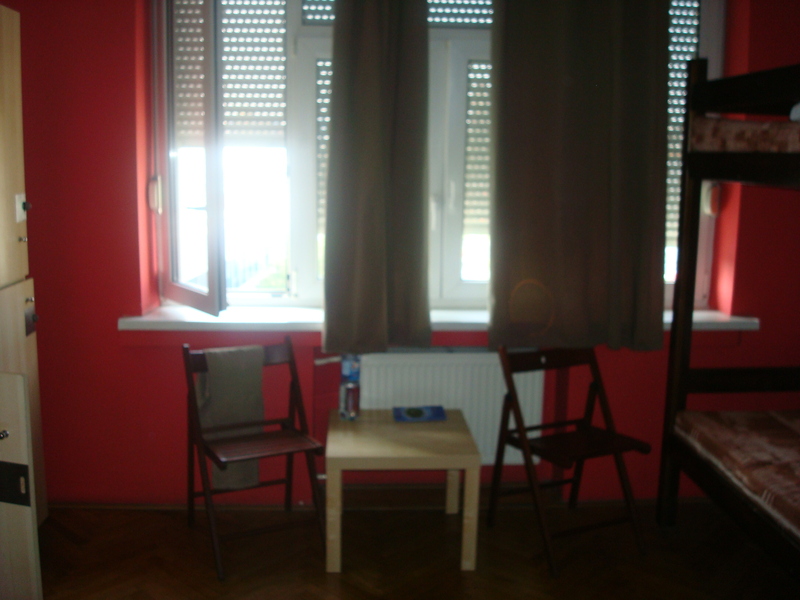 I will choose Hostel Blues again the next time I visit Bratislava. Time to leave Bratislava and make my way back to Prague. It is then that the realisation I will be going home soon hits me. My mood becomes melancholic. As I left the Hostel Blues the feeling of saying goodbye to people had begun to tear into me. All I could think about was the thought of being home and back to the grind that is work. At least the sun was shining and I was listening to good music. That had lightened the mood. I arrived into Prague at around 5pm. I made my way back to the hostel St. Christopher’s at Mosaic House. It felt like an old friend to me. I checked in and found myself sharing a dorm with five Argentinians. Nothing wrong with that except they were a bit loud and frankly I did not feel in the mood to put up with this. I had to go and change my Euro’s into Czech Koruna’s. When I arrived back I bumped into one of the Argentinians who asked if I could swap rooms with one of their friends. I was only too happy to oblige and so I moved. I am used to this by now. Once settled in I decided to go and have something to eat. 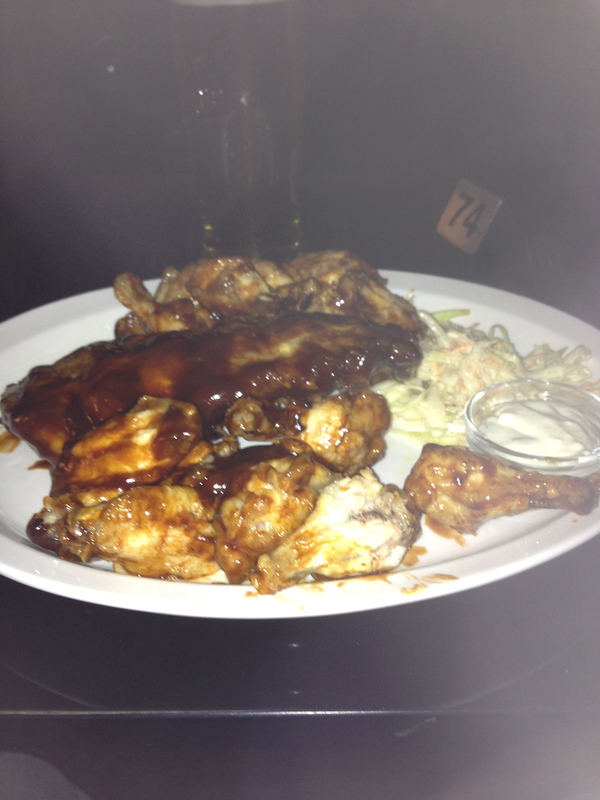 The bar-b-q wings and ribs were great if not a bit sticky. However, the feeling that I was going home would not leave me and I was not enjoying the beer. Also I was feeling tired so it was best to get off to bed early and chill out. I think I may have booked too many days in Bratislava. I had seen everything that I needed to see so it was a case of finding things to do. This was a chance to do some laundry. This will kill the morning for me. Also the weather had turned cooler and there was a hint of rain. Once my laundry was finished I ventured out to a couple of places that I had not visited. To be honest I just ended up walking around the streets. It seemed so quiet. I ended up back at Shtoor for another sandwich, coffee plus the delicious cheesecake. It was there when I realised that I had not made my way to the Presidential Palace as shown to me during the walking tour. I made my way to the palace. The weather not getting better and by this time all I wanted to do was to go back to the hostel. When I arrived back at the hostel I noticed a lot of activity in the kitchen. 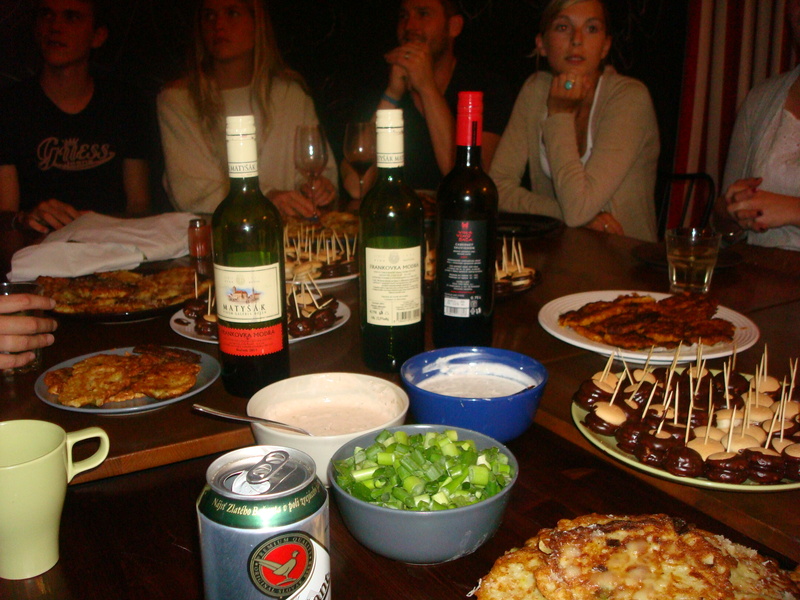 When I enquired about what was happened I was told it was the communal cooking night and on the menu was potato cakes. There was about twenty of us getting stuck in preparing and cooking the cakes. What was great to see was the mixture of nationalities getting involved. There were Americans, Australian, Mexicans, New Zealanders and Canadians. I was the only Brit. We all helped also helped with the washing up afterwards. It was an ideal way to spend the evening. Eating good food, drinking beer and wine and playing silly games which usually ended up with a forfeit of drinking plum brandy. This is was staying in the a hostel is all about and I want to experience more of this.